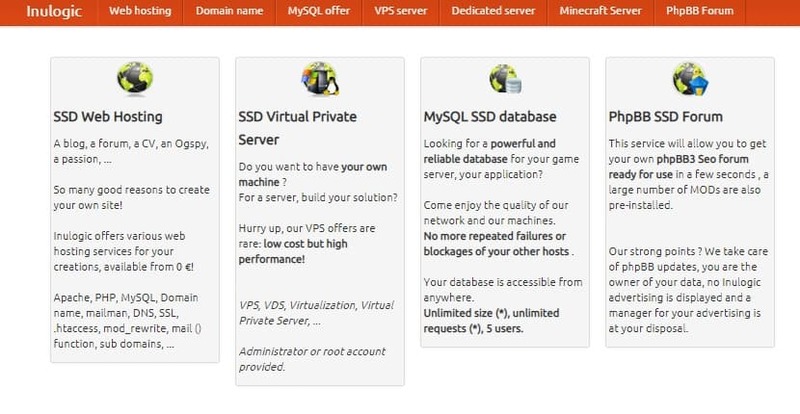 Inulogic Review 2019: Is Inulogic a Good Hosting? Established in 2010, Inulogic is a French web hosting and domain registration service provider that offers high performance SSD powered hosting solutions at competitive pricing and an unparalleled customer support at all levels. Based in France, Inulogic is a web hosting and domain registration company that offers high performance SSD web hosting to French based companies and clients. They have top-of-the-line infrastructure with robust servers in a secure facility in Paris, all backed by an excellent customer support team. Inulogic makes use of high-quality equipment from distinguished brands DELL, Western Digital, LSI, Intel. They also use their own autonomous network and IP tools to ensure maximum availability and independence. The icing on the cake is that all their higher level plans and dedicated servers are connected to fast SSD drives. So there’s no question about the speed and performance of your websites and apps. Every hosting account comes with a Plesk control panel which is among the top two management tools in the hosting market along with cPanel. It is a relatively simple control panel with a nice set of features and tools that you can use to administer your hosting account. From the dashboard, you can set up and manage email accounts, create and configure databases and even deploy the one-click app installer with numerous scripts for building blogs, websites, content management systems, and estore. Inulogic is among the few companies that offer free basic hosting. And what I found interesting is that they do not even advertise it. As expected, this free option comes with limited features. You can start with this option to test the waters before you commit yourself to any of their higher level plans. Scaling up the hosting plans is quite easy and you won’t experience much downtime. I found their prices relatively cheaper considering they use SSD drives. Four billing cycles are available; 1 month, 3 months, and 6 months. When you sign up, you pay via major debit cards, credit cards, and even Bitcoins. Support is only available in French. Their customer support team comes across as friendly and honest professionals who really want to help you get the most out of your hosting account. You can reach them by phone, email, support, or live chat. In addition, they have an online ticket system (accessible from the client area) and an active forum where you can post your queries and get instant help. DIY guys, where you at? Be sure to check out their detailed documentation. I believe it come handy when you’re troubleshooting simple hosting issues. Inulogic is a fantastic choice for customers who’re looking for shared hosting, VPS, and SSD powered dedicated servers at reasonable prices. Wondering how Inulogic stacks up against other Web Hosting companies? Enter any other Web Hosting company and we will give you a side-by-side comparison.